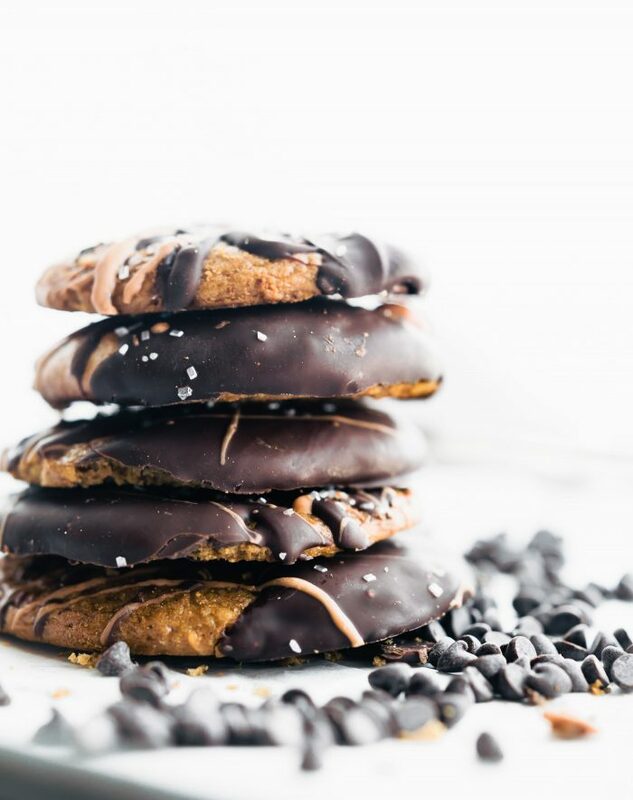 Make Cookies part of a healthy breakfast with these Dark Chocolate dipped Almond Butter Breakfast Cookies! 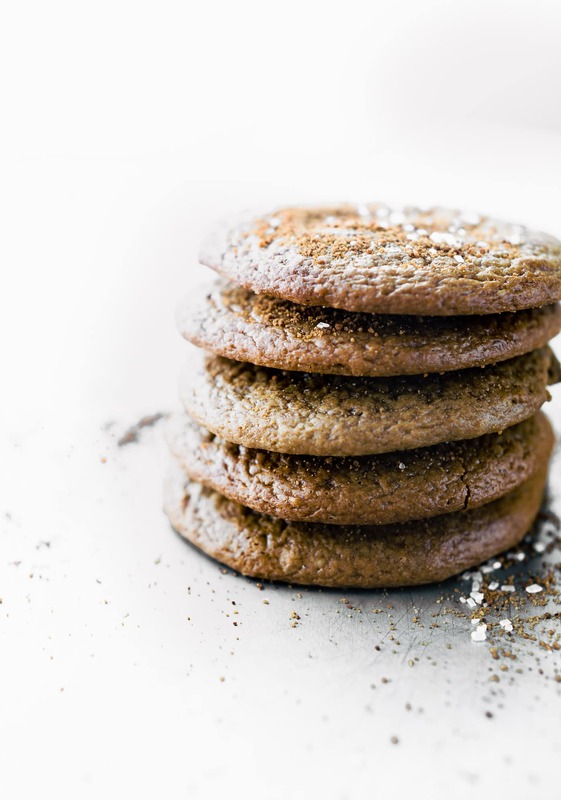 A paleo friendly breakfast cookie made with simple wholesome ingredients and unrefined natural sugars. Portable, easy, delicious! Two words.. BREAKFAST COOKIES. They belong together, right? But why? Other than the pure fact that I will wake up fro breakfast cookies and coffee with much more enthusiasm than say, breakfast toast. Haha! In all seriousness, what makes a breakfast cookie a breakfast cookie? This is a serious question. Is it because it’s healthier so you can justify eating cookies for breakfast? Is it that it’s portable or kid friendly? Is it that I have some kind of whole-grain oatmeal in it? Is it that it contains fruit? Or should we just call it a cookie and be done with it. Healthy cookie. You see, this really doesn’t justify our answer. Well my friends, we don’t have time to debate on whether these dark chocolate almond butter breakfast cookies are really just cookies. But I do know this! 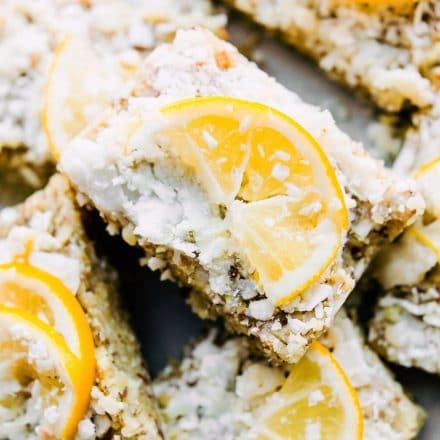 They are gluten free, dairy free, paleo friendly, and refined sugar free. Either way, these cookies are made to nourish or enjoy ANYTIME of day! A breakfast on the go or midnight snack with milk….make that coconut milk. Haha! You choose. Oh my goodness. Spending three paragraph talking about the definition of a cookie and whether it’s suitable for breakfast is probably the least entertaining ever! But stay with me here, we are going to take this cookie definition to a whole new healthy level. As you can recall, my husband has been running to work. We’ve been feeling him with instant pot oatmeal jars, lemon coconut bars, and all the things meal prepish. 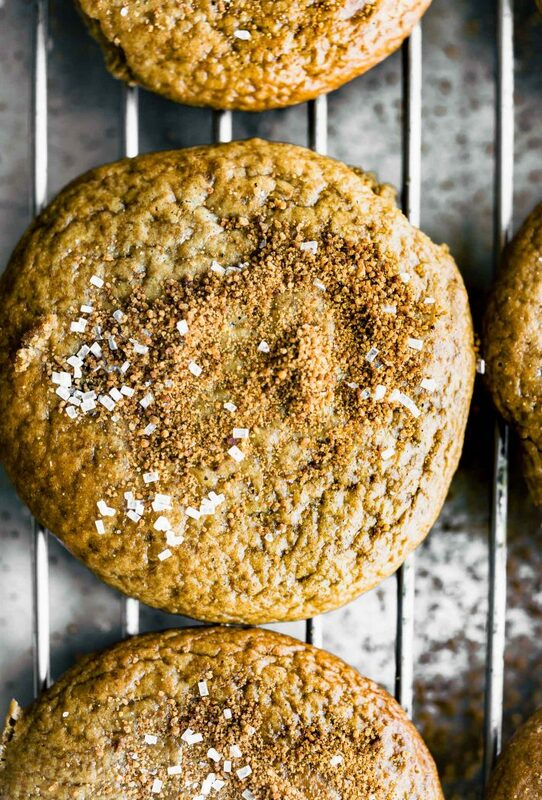 Well, add these breakfast cookie to the list. Variety is key, right? Or in our case, portable and healthy is key. FIRST –> Banana. This is what’s going to replace the oil and some of the sugar. 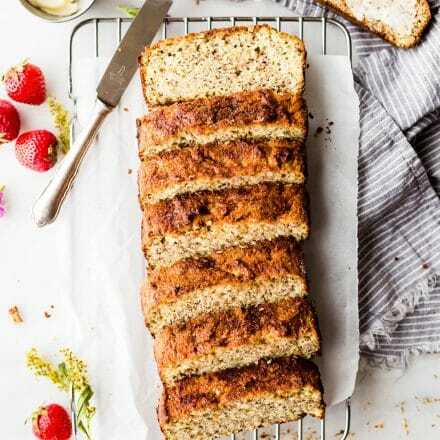 It’s rich in potassium, magnesium, plus it gives it that breakfast taste! SECOND –> We have a gluten free starch. Tapioca or ground oats! Both rich in fiber and flourless! THIRD –> One egg. You know for protein and such. Bonus: Rich in choline too! And FIFTH –> Molasses. Oh yea!! Plant based iron to boot! A natural sugar with a good source of minerals. 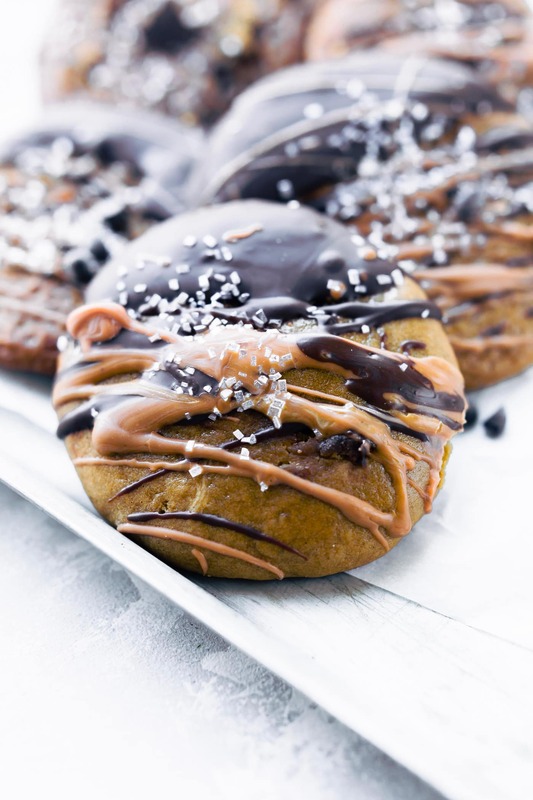 Then there is an option to leave these cookies plain, without the dip in dark chocolate. They turn out soft and similar to a peanut butter cookie taste. That being said, I’m not sure you don’t want take that option. Besides, true dark chocolate contains loads of antioxidants. You’re welcome. 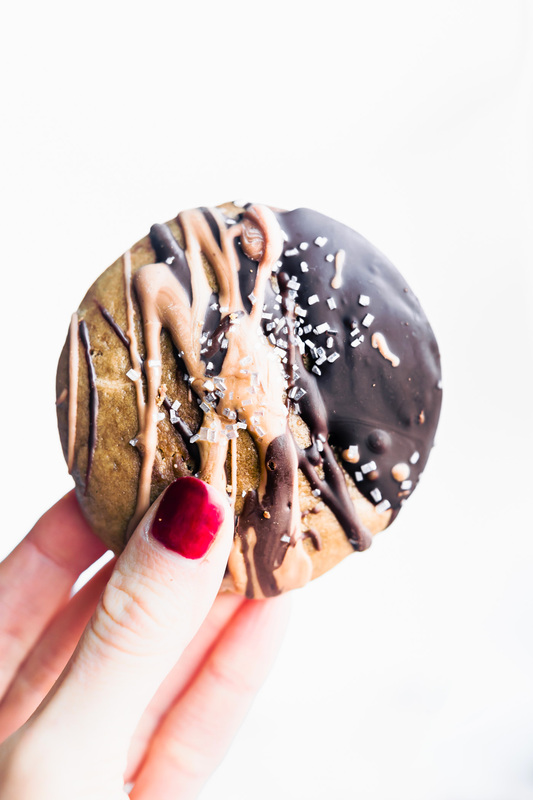 I also drizzled these cookies with extra melted almond butter and sparkling cane sugar. Oops. Totally optional though! Hey, that’s just my inner foodie wanting everything to look pretty. Can you blame me? 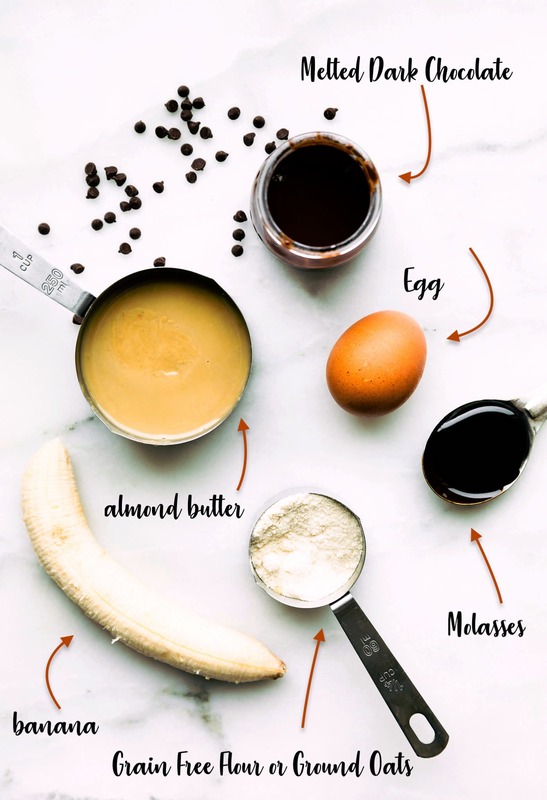 Almond butter, bananas, eggs, and chocolate make a paleo friendly breakfast cookie made with simple wholesome ingredients and unrefined natural sugars. Portable, easy, delicious! Optional sparkling cane sugar for topping. Place your almond butter, egg, and banana in a large bowl or stand mixer. Mix well until banana is blended. Add in your flour, sugar, spices, baking powder, and extract. Fold in your molasses and pinch of sea salt. Then you want to chill the dough/batter in the fridge for 1-2 hours or freeze for 15-20 minutes. This is crucial. After the dough hardens, you can then scoop onto a lined baking sheet at least 2 inches apart. NOTE –> Depending on the nut butter you used, the batter still might be a little thin. If that’s the case, just add 1-2 tbsp more flour. Press each cookie flat with a fork. Make sure you have a lot of space between cookies because they will spread. Bake at 350F for 9-11 minutes. Longer if you want crispier edges or if you are cooking at altitude. Let cool completely before moving to a wire rack. As the cookies cool, melt your chocolate. Place 1/2 cup dark chocolate chips in microwave safe bowl. Add a teaspoon of coconut oil (the oil is optional but it helps thin it out if needed). Heat in 30 second intervals until melted. 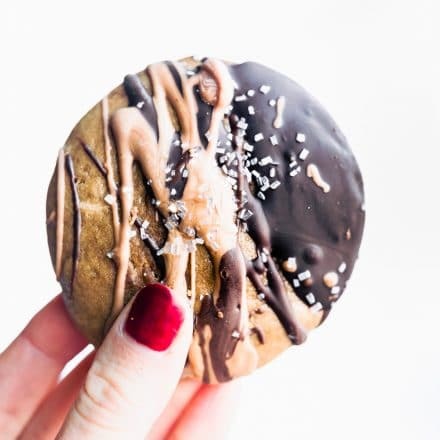 When cookies are cooled, dip half into the chocolate or drizzle chocolate on top of cookies. Place on lined pan or plate. Repeat for all the cookies. Feel free to add a touch of cinnamon, sparkling cane sugar, melted almond butter, or sea salt on top. Place the cookies in fridge to cool the chocolate coating. Makes 12-14 cookies. For best results, keep in fridge. 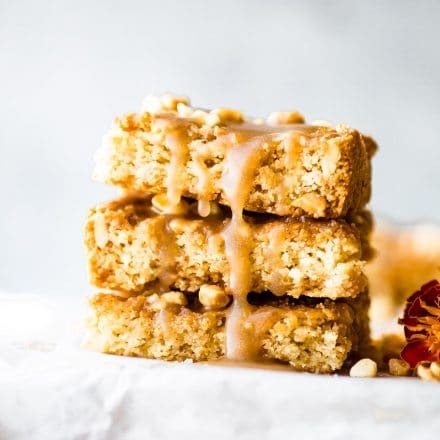 Sugar options – You can try raw cane sugar or xylitol, but the baking texture/times might vary. I have not tested it yet. 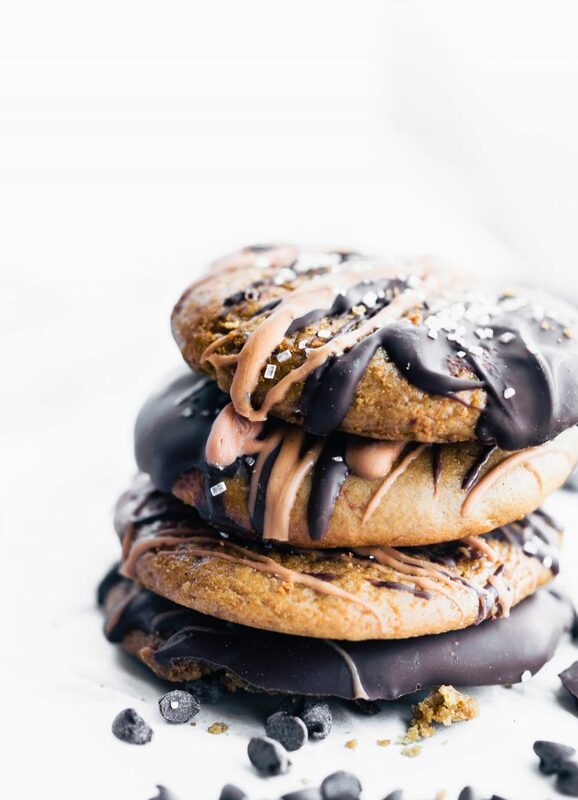 Okay, so all in all think of this as nutter butter cookies meets banana oatmeal breakfast drizzled in dark chocolate such and such. Or something like that. So the question remains…. is this a cookie or breakfast cookie? WOW these cookies look amazing! So delicious and I really love your photos! Soooo good! Love these cookies! Pictures are amazing! This recipe sounds delicious!! 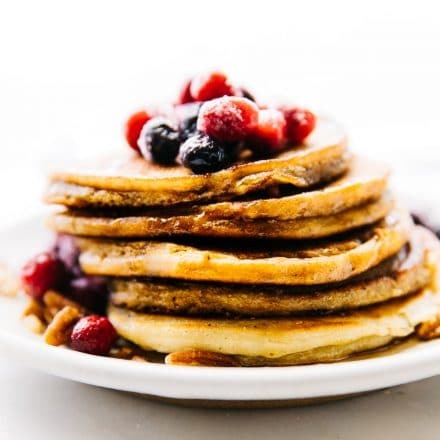 Thank you so much for having a skip to recipe button 😀 As someone with food intolerances, I often like to check out what’s in a recipe before I fall in love with the outcome and dive into the details of how to make it. Can’t wait to make these breakfast cookies! Wow I totally need to make these this weekend! LOVE the photos as well! Any time you’re serving up cookies for breakfast, I’m in! These look awesome Lindsay! on my way with mimosas now! I love these breakfast cookies! Such a treat to start the day! It depends. If the bread has ample butter pockets, I might choose breakfast bread over cookies…unless of course it was these specific cookies because they look and sound all kinds of magical. Like unicorns but better. I have been drooling over these since I spotted them at the end of last week. I need to try them ASAP! Cookies all ay long! Yea! get her done! haha breakfast at my house. I’ll have these for breakfast, lunch, AND dinner!! 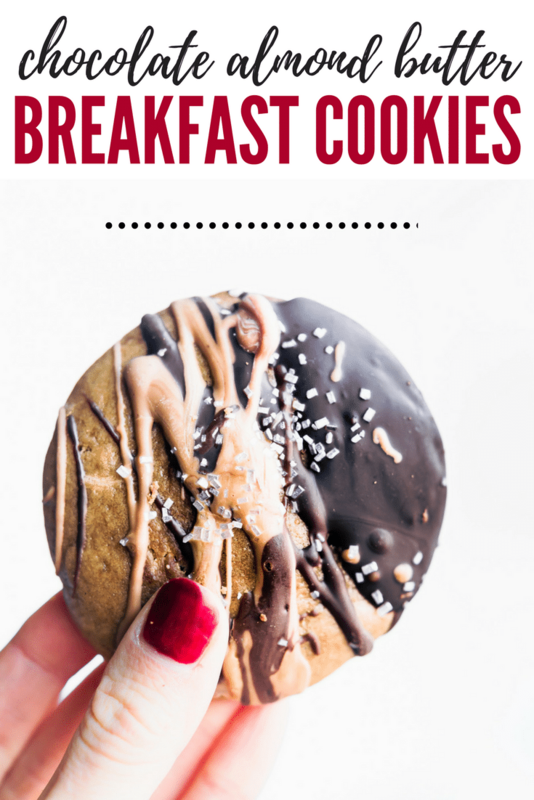 I am just now on the breakfast cookie train (WHERE HAVE I BEEN) and these look INCREDIBLE! These photos too, WOW! You blow me away. These look delicious! I will definitely be making them soon but what brand of almond butter do you use? I like using Maranath no stir or even sunbutter. They seem to be extra creamy and not dry, ya know? Would these work with almond flour or coconut flour or a combination? I think so! Maybe 3 tbsp almond flour and 1 to 2 tbsp coconut flour. I’m not sure how high they will rise though.